Professor Adam McCluskey has been a driving force behind the establishment of the Centre for Kinomics, a world-first research facility. McCluskey has established the Centre in collaboration with respected neurobiologist Professor Phil Robinson, of the Children's Medical Research Institute (CMRI) at Westmead. The Centre is named for a biological process called phosphorylation that is mediated by kinases, hence 'kinomics', and which controls the activation of many signalling and enzymatic proteins. The Centre, which has laboratories at the University of Newcastle and CMRI, has been funded by a $1 million prize from the Ramaciotti Foundation and a $3.1 million grant from the Australian Cancer Research Foundation for the study of protein kinases and the drugs that target them. The Centre's focus is designing next­ generation drugs for epilepsy, cancer and neuropathic pain. So far the focus has been epilepsy, a disorder where one in three sufferers gain no relief from existing treatments. The goal is creating drugs that do not have the often­ debilitating side effects. The emerging field revolves around the 518 protein kinases in the body, which are the key signalling proteins behind biological functions. If they malfunction then the body malfunctions. Pharmaceutical companies invest billions of dollars in research to develop kinase inhibitors. "It's a crude analogy," says McCluskey, "but in drug design there is the lock and the key. You either want to lock or unlock the protein action and the drug is the key that will enable you to do that." 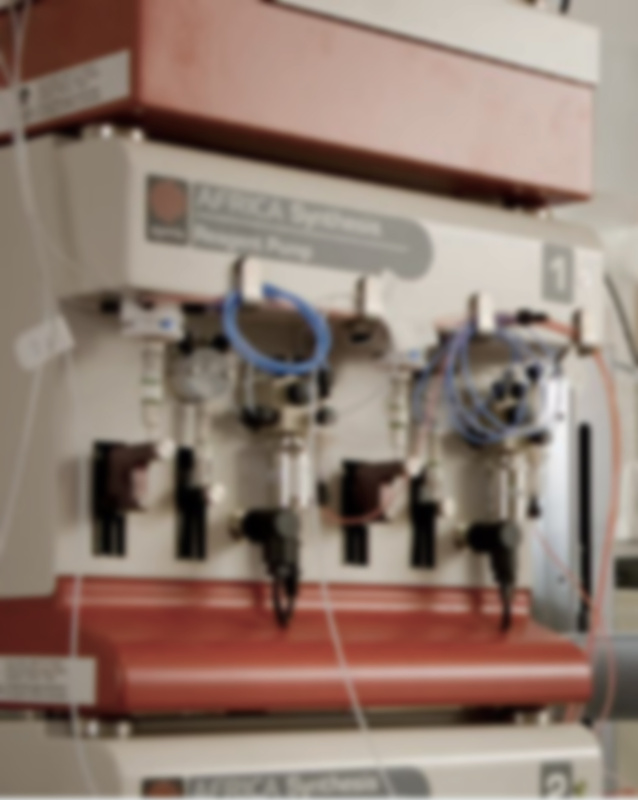 Using unique equipment costing hundreds of thousands of dollars, the researchers are able to quickly pinpoint the undesirable elements of existing therapeutic drugs. "We can identify the range of proteins a drug interacts with and look out for red flags," explains McCluskey, a chemist. "There are some proteins you would never want a drug to touch because of the serious, even deadly, side effects." The Centre is extending a 2007 discovery by a private German drug company that involves a new technique for analysing interactions between kinase inhibitors and hundreds of proteins at a time. The technology is known as Kinobeads and it fast tracks what has been until now a time-consuming process. Mass spectrometry determines what proteins have been singled out by the Kinobeads, indicating which kinases have remained bound to the drug in question. The process would normally take at least six months but the Centre's cutting-edge technology will reduce it to a few days. There are 23 research groups around the world waiting for the Centre to produce its first batch of beads. This technology gives us the ability to rapidly enhance our potential to test and manufacture pharmaceuticals that will benefit many individuals suffering from a range of disorders. Professor McCluskey's research is conducted in collaboration with the Hunter Medical Research Institute's (HMRI) Cancer Research Program. 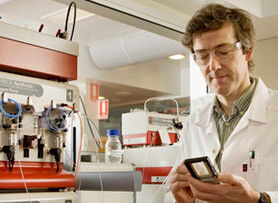 His research is supported by grants from HMRI. I am a (BScHons and PhD) graduate in chemistry of the University of Strathclyde, Scotland. I am a teaching and research active academic who believes that nurturing students and introducing a positive research experience is one of the pillars of teaching at the University of Newcastle. My primary area of resaerch is in the medicinal chemistry / chemical biology space where my main focus is in the development of tool compounds, and drugs, targeting endocytosis. The potential outcomes of our research include (but are not limited to) the development of new synthetic methodologies; the development of new drugs & the development of new tools for dissecting signal transduction pathways. This led to the establishment of the dynamin modulators platform of which I am team leader (chemistry). This team interacts with, and supplies the only known endocytosis inhibitors to research teams worldwide (UK, USA, Germany, Denmark etc). I am also an integral component of the development of new anti-epileptic drugs alongside the National Institute of Health, National Institute of Neurological Disorders and Stroke (Bethesda USA). I head the chemistry component of the Australian Cancer Research Foundation (supported by Ramaciotti) Centre for Kinomics (CFK), a new approach for direct profiling of cellular kinases, a multi-million dollar initiative providing a unique service to multiple research teams throughout Australia. Kinases are the cancer drug target of the 21st century. The CFK offers a unique opportunity to profile biological probes (drugs) and cellular kinases to identify new therapeutic targets, new uses for old drugs and rapid IC50 determination of individual compounds against the entire cellular kinome (cellular complement of protein kinases). 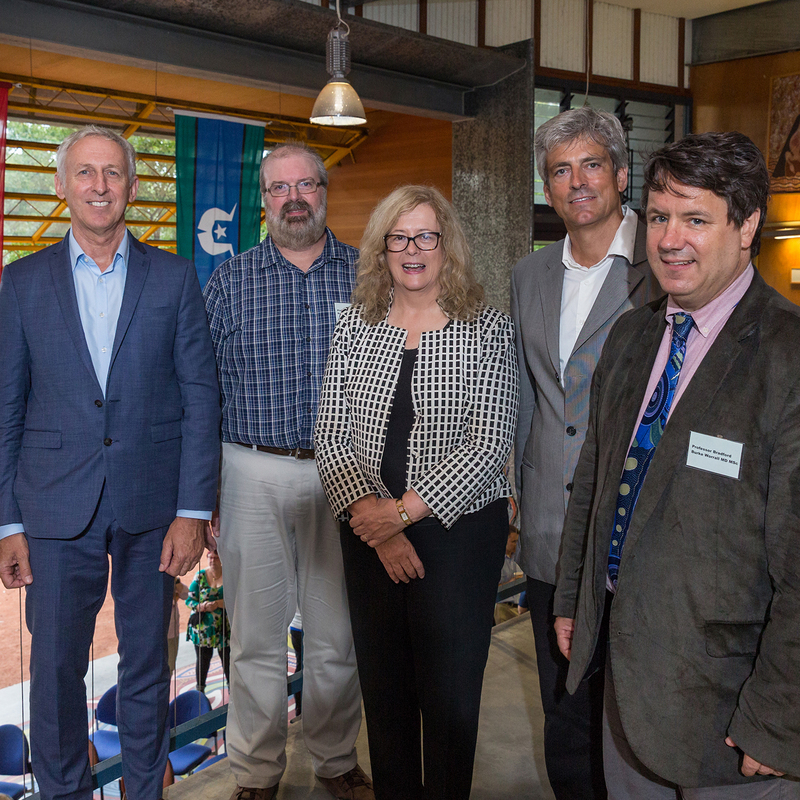 The CFK at the University of Newcastle has established one of the first fully equipped flow chemistry laboratories in Australia. © 2015 Elsevier Ltd. All rights reserved. Many bacterial pathogens produce toxins that target intracellular molecules to alter or disrupt normal cellular function. To access the cell, these toxins often exploit endocytic pathways, recruit cellular machinery, or both to mediate their own internalization. Bacteria are becoming increasingly resistant to antibiotics, so alternatives to treat or prevent diseases caused by bacterial toxins are necessary. The advent of small molecule inhibitors, which target key proteins involved in endocytic trafficking pathways, provides an opportunity to develop these compounds as potential therapeutic inhibitors of bacterial toxicity. This chapter reviews the endocytic pathways commonly hijacked by these toxins and the drugs that are currently being developed to inhibit specific proteins involved in endocytosis. It further evaluates the feasibility of using these compounds to investigate the modalities of the endocytosis and trafficking of bacterial toxins, and the potential for the use of these drugs as therapeutics in the future. © 2018 Elsevier Ltd In recent studies on the multicomponent route described in our original submission , we gained access to crystalline material suitable for X-ray analysis (Scheme 1). This revealed that our original structural assignment based on NMR, IR and MS evidence was incorrect. The product arising from the multicomponent reaction of ethyl 3-aminocrotonate (1), phenylisothiocyanate (2) and acetic anhydride (3) was not ethyl (Z)-2,4-dimethyl-6-(phenylimino)-6H-1,3-thiazine-5-carboxylate (5), but the thioamide isomer, ethyl 2,4-dimethyl-1-phenyl-6-thioxo-1,6-dihydropyrimidine-5-carboxylate (7) (Scheme 1 and insert). The structure of thioamide (7), and related analogues, is consistent with the NMR and IR data presented in our original submission. Using the compound numbering from the original manuscripts, analogues 8a¿l, are the equivalent thioamides as shown in Table 1. Re-examination of the reaction mechanism based on this data supports a N to S anion resonance with the charge intercepted by acetic anhydride at the nitrogen anion stage [1,2]. As previously proposed, ensuing acetate loss and H-abstraction affords the ene-amine 9 which effects an intramolecular condensation with the N-acyl carbonyl moiety. Loss of water and acetate removal of the proton yields ethyl 2,4-dimethyl-1-phenyl-6-thioxo-1,6-dihydropyrimidine-5-carboxylate (Scheme 2). This mechanism differs only in the interception of the nitrogen anion rather than the sulfur anion by acetic anhydride, but this re-working is necessitated by the structure confirmed herein by X-ray crystallography. We regret any inconvenience this may have caused readers and sincerely apologize for this error. © 2018 Wiley Periodicals, Inc. There are 27 small molecule protein-protein interaction (PPI) modulators in Phase I, II, and III clinical trials targeting cancer, viruses, autoimmune disorders, and as immune suppression agents. Targeting PPIs as an antibiotic drug discovery strategy remains in relative infancy by comparison. However, a number of molecules are in development which target PPI within the replisome, divisome, transcriptome, and translatome are showing significant promise at the medicinal chemistry stage of drug development. Hence, the success of future PPI agents as antibiotics will build upon the techniques and design strategies of these molecules. © 2014. The use of 3-dimensional (3D) collagen gels has yielded new insights into the migratory behaviour of cancer cells. While the large GTPase dynamin has emerged as an important regulator of cancer cell migration and invasion under 2D conditions, its role in 3D migration is unclear. We have used a potent dynamin modulator, a bis-tyrphostin derivative, Ryngo® 1-23, to investigate the role of dynamin in 3D migration in 3 different cell lines. The compound specifically inhibits persistent, elongated 3D migration in U87MG and SMA-560 cells. Treated U87MG cells adopt a rounded morphology that is not due to apoptosis, loss of matrix metalloprotease activity or inhibition of clathrin-mediated endocytosis. Given that Ryngo 1-23 is known to regulate dynamin oligomerisation and actin dynamics at the leading edge, we analysed actin filament distribution. Ryngo 1-23 induced a switch in actin filament organization in 3D cultures resulting in the generation of multiple short actin-rich microspikes. Correlated with the change in actin filament distribution, cells displayed reduced collagen gel contraction. Since acto-myosin force transmission to the extra-cellular matrix underpins persistent, elongated migration, our results suggest that Ryngo 1-23 modulates this process in 3D migration via dynamin-mediated regulation of acto-myosin force transmission to the extra-cellular matrix. Chlorpromazine is a phenothiazine-derived antipsychotic drug (APD) that inhibits clathrin-mediated endocytosis (CME) in cells by an unknown mechanism. We examined whether its action and that of other APDs might be mediated by the GTPase activity of dynamin. Eight of eight phenothiazine-derived APDs inhibited dynamin I (dynI) in the 2-12µm range, the most potent being trifluoperazine (IC<inf>50</inf> 2.6±0.7µm). They also inhibited dynamin II (dynII) at similar concentrations. Typical and atypical APDs not based on the phenothiazine scaffold were 8- to 10-fold less potent (haloperidol and clozapine) or were inactive (droperidol, olanzapine and risperidone). Kinetic analysis showed that phenothiazine-derived APDs were lipid competitive, while haloperidol was uncompetitive with lipid. Accordingly, phenothiazine-derived APDs inhibited dynI GTPase activity stimulated by lipids but not by various SH3 domains. 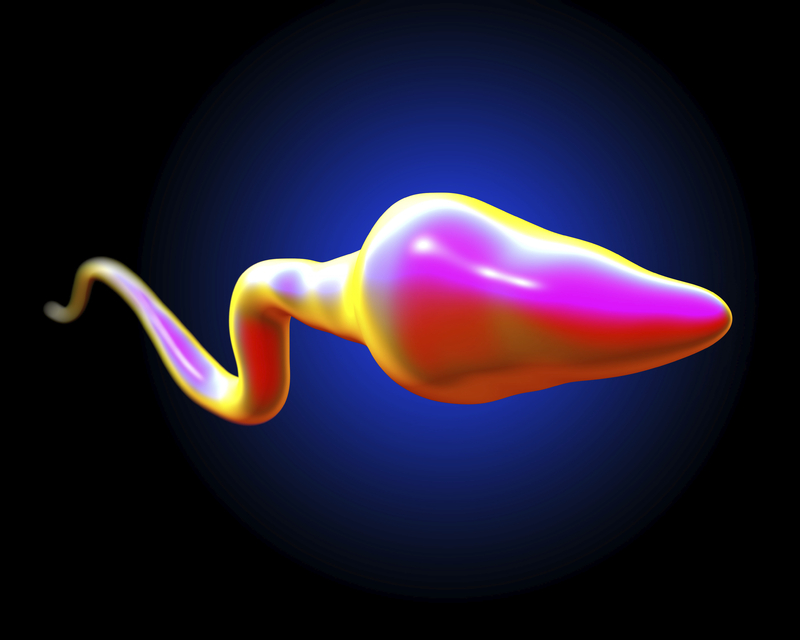 All dynamin-active APDs also inhibited transferrin (Tfn) CME in cells at related potencies. Structure-activity relationships (SAR) revealed dynamin inhibition to be conferred by a substituent group containing a terminal tertiary amino group at the N2 position. Chlorpromazine was previously proposed to target AP-2 recruitment in the formation of clathrin-coated vesicles (CCV). However, neither chlorpromazine nor thioridazine affected AP-2 interaction with amphiphysin or clathrin. Super-resolution microscopy revealed that chlorpromazine blocks neither clathrin recruitment by AP-2, nor AP-2 recruitment, showing that CME inhibition occurs downstream of CCV formation. Overall, potent dynamin inhibition is a shared characteristic of phenothiazine-derived APDs, but not other typical or atypical APDs, and the data indicate that dynamin is their likely in-cell target in endocytosis. © 2015 The Royal Society of Chemistry. Fragment-based in silico screening against dynamin I (dynI) GTPase activity identified the 1,8-naphthalimide framework as a potential scaffold for the design of new inhibitors targeting the GTP binding pocket of dynI. Structure-based design, synthesis and subsequent optimization resulted in the development of a library of 1,8-naphthalimide derivatives, called the Naphthaladyn¿ series, with compounds 23 and 29 being the most active (IC<inf>50</inf> of 19.1 ± 0.3 and 18.5 ± 1.7 µM respectively). Compound 29 showed effective inhibition of clathrin-mediated endocytosis (IC<inf>50(CME)</inf> 66 µM). The results introduce 29 as an optimised GTP-competitive lead Naphthaladyn¿ compound for the further development of naphthalimide-based dynI GTPase inhibitors. © 2015 The Royal Society of Chemistry. The protein kinase inhibitor CTx-0152960 (6, 2-((5-chloro-2-((4-morpholinophenyl)amino)pyrimidin-4-yl)amino)-N-methylbenzamide), and the piperazinyl analogue, CTx-0294885 (7, 2-((5-chloro-2-((4-piperazin-1-ylphenyl)amino)pyrimidin-4-yl)amino)-N-methylbenzamide), were prepared using a hybrid flow and microwave approach. The use of flow chemistry approaches avoided the need for Boc-protection of piperidine in the key SNAr coupling with 1-fluoro-4-nitrobenzene. Microwave coupling of 4-morphilinoaniline 8 and 4-(piperazine-1-yl)aniline 9 with 2-(2,5-dichloropyrimidine-4-ylamino)-N-methylbenzamide 10, proved to be the most efficacious route to the target analogues 6 and 7. This hybrid methodology reduced the number of synthetic steps, gave enhanced overall yields and increased atom economy through step reduction and minimal requirement for chromatographic purification, relative to the original batch synthesis approach. © 2015, American Society for Microbiology. Simian hemorrhagic fever virus (SHFV) causes a severe and almost uniformly fatal viral hemorrhagic fever in Asian macaques but is thought to be nonpathogenic for humans. To date, the SHFV life cycle is almost completely uncharacterized on the molecular level. Here, we describe the first steps of the SHFV life cycle. Our experiments indicate that SHFV enters target cells by lowpH- dependent endocytosis. Dynamin inhibitors, chlorpromazine, methyl-ß-cyclodextrin, chloroquine, and concanamycin A dramatically reduced SHFV entry efficiency, whereas the macropinocytosis inhibitors EIPA, blebbistatin, and wortmannin and the caveolin-mediated endocytosis inhibitors nystatin and filipin III had no effect. Furthermore, overexpression and knockout study and electron microscopy results indicate that SHFV entry occurs by a dynamin-dependent clathrin-mediated endocytosislike pathway. Experiments utilizing latrunculin B, cytochalasin B, and cytochalasin D indicate that SHFV does not hijack the actin polymerization pathway. Treatment of target cells with proteases (proteinase K, papain, a-chymotrypsin, and trypsin) abrogated entry, indicating that the SHFV cell surface receptor is a protein. Phospholipases A2 and D had no effect on SHFV entry. Finally, treatment of cells with antibodies targeting CD163, a cell surface molecule identified as an entry factor for the SHFVrelated porcine reproductive and respiratory syndrome virus, diminished SHFV replication, identifying CD163 as an important SHFV entry component. Clathrin-mediated endocytosis (CME) is a process that regulates selective internalization of important cellular cargo using clathrin-coated vesicles. Perturbation of this process has been linked to many diseases including cancer and neurodegenerative conditions. Chemical proteomics identified the marine metabolite, 2-hydroxy-5-methoxy-3-(((1S,4aS,8aS)-1,4a,5-Trimethyl-1,2,3,4,4a,7, 8,8a-octahydronaphthalen-2-yl)methyl)cyclohexa-2,5-diene-1,4-dione (bolinaquinone) as a clathrin inhibitor. While being an attractive medicinal chemistry target, the lack of data about bolinaquinone&apos;s mode of binding to the clathrin enzyme represents a major limitation for its structural optimization. We have used a molecular modeling approach to rationalize the observed activity of bolinaquinone and to predict its mode of binding with the clathrin terminal domain (CTD). The applied protocol started by global rigid-protein docking followed by flexible docking, molecular dynamics and linear interaction energy calculations. The results revealed the potential of bolinaquinone to interact with various pockets within the CTD, including the clathrin-box binding site. The results also highlight the importance of electrostatic contacts over van der Waals interactions for proper binding between bolinaquinone and its possible binding sites. This study provides a novel model that has the potential to allow rapid elaboration of bolinaquinone analogues as a new class of clathrin inhibitors. © 2014 by the authors. Two libraries of highly decorated norcantharidin analogues were accessed via a series of sequential chemoselective flow hydrogenations and solvent-free transformations. Utilising a 10% Pd/C catalyst, modifications to reaction parameters (H2 pressure, temperature and flow rate conditions) allowed facile access to effect selective direct reductive aminations and olefin reductions in the presence of furan, benzyl and nitrile moieties were established. The use of 20% Pd(OH)2/C; Pd tetrakis; 5% Pt/C (sulfided) gave mixtures of furan and olefin (both reduced) and olefin reduced products. RuO2; 0.5% Re/C and Re2O7 resulted in no reduction. Concurrent olefin and nitrile reduction was achieved in the presence of furan moieties by employing a RANEY® nickel catalyst. In total, 31 reaction conditions were examined using less than 200 mg of reagents allowing optimised conditions to be efficiently determined. These optimised hydrogenation conditions afforded desired analogues in near quantitative yields thus removing the requirements of reaction workup and chromatography. © 2014 The Royal Society of Chemistry. © The Royal Society of Chemistry 2014. A commonly observed limitation of conducting hydrogenations under flow chemistry conditions is hydrodehalogenation. In a bid to circumvent this limitation a series of hydrogenation catalysts were screened, with 5% Pt/C (sulfided) catalyst identified as an effective catalyst to selectively effect reductive aminations, nitro reduction, and alkene reductions in the presence of halogen atoms. Additionally the optimised protocol cleanly reduced imines in the presence of a furan moiety indicating potential amenability to other labile functionalities. Virtual screening of the ChemDiversity and ChemBridge compound databases against dynamin I (dynI) GTPase activity identified 2,5-bis-(benzylamino)-1,4- benzoquinone 1 as a 273 ± 106 µM inhibitor. In silico lead optimization and focused library-led synthesis resulted in the development of four discrete benzoquinone/naphthoquinone based compound libraries comprising 54 compounds in total. Sixteen analogues were more potent than lead 1, with 2,5-bis-(4-hydroxyanilino)-1,4-benzoquinone (45) and 2,5-bis(4-carboxyanilino)- 1,4-benzoquinone (49) the most active with IC50 values of 11.1 ± 3.6 and 10.6 ± 1.6 µM respectively. Molecular modelling suggested a number of hydrogen bonding and hydrophobic interactions were involved in stabilization of 49 within the dynI GTP binding site. Six of the most active inhibitors were evaluated for potential inhibition of clathrin-mediated endocytosis (CME). Quinone 45 was the most effective CME inhibitor with an IC50(CME) of 36 ± 16 µM. © 2014 Published by Elsevier Masson SAS. All rights reserved. The Hedgehog (Hh) signalling pathway plays a pivotal role in the spatial and temporal regulation of cell proliferation and differentiation. By controlling the correct maturation of developing tissues and ensuring attainment of the correct size, position and the presence of fully functioning cellular structures, the Hh plays a pivotal role in development. Conversely aberrant Hh signalling is involved in Gorlin syndrome, basal cell carcinoma (the most common cancer in the world), and more than one third of all human medulloblastoma cases. In all of these cases, it is believed that deregulated Hh signalling leads to increased cell proliferation and tumour formation. Inhibition of the Hedgehog signalling pathway, is a recently validated anti-cancer drug target, with vismodegib (Erivedge¿), approved by the U.S. Food and Drug Administration for the treatment of adult basal cell carcinoma. In this perspective we outline the current state of Hh pathway inhibitors with a particular focus on potential limitations of upstream Hh pathway inhibition in relation to resistance mutations and crosstalk pathways. Together, these limitations indicate that inhibition of downstream components, specifically the Gli family of transcription factors, may represent a next generation approach to suppress tumours associated with aberrant Hh pathway signalling. © 2014 The Royal Society of Chemistry. © 2014 Nature America, Inc. All rights reserved. This protocol describes the synthesis of two classes of clathrin inhibitors, Pitstop 1 and Pitstop 2, along with two inactive analogs that can be used as negative controls (Pitstop inactive controls, Pitnot-2 and Pitnot-2-100). Pitstop-induced inhibition of clathrin TD function acutely interferes with clathrin-mediated endocytosis (CME), synaptic vesicle recycling and cellular entry of HIV, whereas clathrin-independent internalization pathways and secretory traffic proceed unperturbed; these reagents can, therefore, be used to investigate clathrin function, and they have potential pharmacological applications. Pitstop 1 is synthesized in two steps: sulfonation of 1,8-naphthalic anhydride and subsequent reaction with 4-amino(methyl)aniline. Pitnot-1 results from the reaction of 4-amino(methyl)aniline with commercially available 4-sulfo-1,8-naphthalic anhydride potassium salt. Reaction of 1-naphthalene sulfonyl chloride with pseudothiohydantoin followed by condensation with 4-bromobenzaldehyde yields Pitstop 2. The synthesis of the inactive control commences with the condensation of 4-bromobenzaldehyde with the rhodanine core. Thioketone methylation and displacement with 1-napthylamine affords the target compound. Although Pitstop 1-series compounds are not cell permeable, they can be used in biochemical assays or be introduced into cells via microinjection. The Pitstop 2-series compounds are cell permeable. The synthesis of these compounds does not require specialist equipment and can be completed in 3-4 d. Microwave irradiation can be used to reduce the synthesis time. The synthesis of the Pitstop 2 family is easily adaptable to enable the synthesis of related compounds such as Pitstop 2-100 and Pitnot-2-100. The procedures are also simple, efficient and amenable to scale-up, enabling cost-effective in-house synthesis for users of these inhibitor classes. Dynamin is a large GTPase with roles in membrane fission during clathrin-mediated endocytosis, in actin dynamics and in cytokinesis. Defects in dynamin have been linked to human diseases. The synthesis of a dynamin modulator toolkit comprising two different inhibitor classes is described. The first series comprises Dynole 34-2, Dynole 2-24 and the inactive control Dynole 31-2. The Dynole compounds act on the dynamin G domain, are not GTP competitive and can be synthesized in 2-3 d. Knoevenagel condensation of 1-(3-(dimethylamino) propyl)-1H-indole-3-carbaldehyde (1) with cyanoamides (2 and 3) affords Dynole 31-2 and Dynole 34-2, respectively. Reductive amination of 1 with decylamine gives Dynole 2-24. The second series acts at an allosteric site in the G domain of dynamin and comprises Dyngo 4a and Dyngo Ø (inactive control). Both are synthesized in an overnight reaction via condensation of 3-hydroxy-2-naphthoic hydrazide with 2,4,5-trihydroxybenzaldehyde to afford Dyngo 4a, or with benzaldehyde to afford Dyngo Ø. © 2014 Nature America, Inc. All rights reserved. This chapter details the novel application of in-situ Attenuated Reflectance Fourier Transform Infrared (ATR FT-IR) spectroscopy to investigate the effect molecular structural variation has on the CO2 absorption characteristics of heterocyclic amines. The reaction between CO2 and a subset of structurally variant amines were analyzed including piperidine, as well as commercially available functionalized piperidine derivatives, for example, those with methyl-, hydroxyl- and hydroxyalkyl- substituents. This new technique uses an ATR probe optically coupled to an FT-IR spectrometer to monitor the reaction species evolving in solution as CO2 is being absorbed into solution. The effect of molecular structural variations on CO 2 absorption was then assessed in relation to the IR identifiable ionic reaction products, CO2 absorption capacity and the mass-transfer coefficient at zero loading. © 2012 American Chemical Society. Gold extraction from complex sulfidic ore occurs in l-butyl-3- methylimidazolium hydrogen sulfate (bmim+HS4-) ionic liquid in the presence of thiourea in a facile, high yielding (86%), recyclable process. Silver recovery from the ore is also enhanced. Gold recovery from ionic liquid / water environments directly by electrodeposition is described. Changing from aqueous acid to ionic liquid solvent causes a growth mode transition to dendritic growth patterns for deposited gold. The role of the corticotropin releasing hormone in the onset of labour and the subsequent medicinal chemistry implications of CRH antagonists for the prevention of premature birth, and identification of the CRH type 1 receptor as the target for this drug design, are reviewed here. In an historic first, under a partnership agreement with Australian-American Fulbright Commission, the University of Newcastle will officially welcome three American Fulbright Scholars this week. Mothers who smoke while they are pregnant or breastfeeding may be damaging the fertility of their sons, according to research published in Human Reproduction.